Pianos need to be tuned regularly if you want it to stay in tip-top condition. Those tuned regularly in the early years will most probably stay in tune for a longer period of time as compared to a piano tuned only at the later years of its life. New pianos will need to be tuned four times in its first year and then every six months in the succeeding years. Although the cost of a tune-up runs from $100-200, it would still be way more expensive to have it restrung. You can ditch the piano tuner but only if you have both the skills and the right piano tuning tools. Otherwise, you run the risk of seriously damaging your piano. The first thing that needs to be said about the piano tuning hammer is that this is the most essential tool for the job. If you don’t have access to a piano tuning hammer, then you aren’t going to be able to perform the job. You need to be able to open the piano up and do the work. It’s also good to understand that this tool goes by a couple of different names. Some people refer to this tool as a piano tuning lever. Others will refer to it as a piano tuning key. These are all referring to the same type of tool, so just use these terms interchangeably, as you please. The important thing to know is that you need one of these. Buying a high-quality piano tuning hammer is highly recommended. You want to purchase one that has a sturdy handle so that you can turn it properly. You need to be able to use your strength to turn it and know that it is going to hold up to regular use. This is why durable wood is used for the handles of these tools. This hammer has an l-shaped design and features a sturdy steel shaft. It is very resistant to abrasions and will be able to last you for a long time. This is a great tool to purchase for tuning pianos and will definitely help you out. It can be beneficial to purchase several different sizes and styles of piano tuning hammers, so you may want to look into others as well. This piano tuning lever tip wrench is going to be one of the most useful tools for tuning certain pianos. 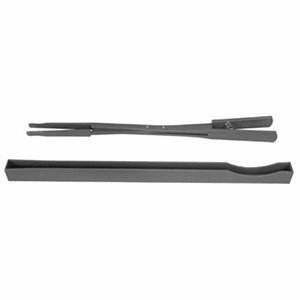 This is used for the removal of tuning lever tips. It can also be put to use when you need to tighten them. The way that it is designed allows you to easily turn it, and this is going to make the process take a lot less effort than it would with another tool. 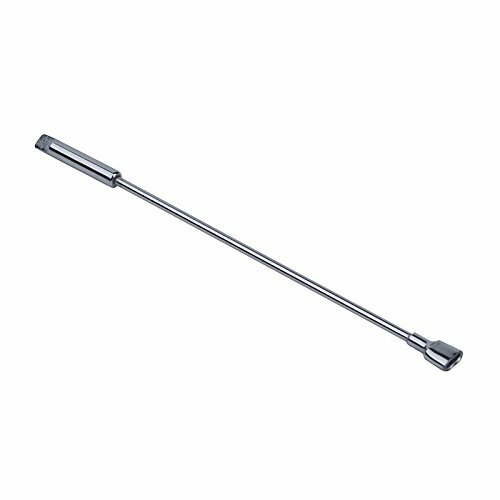 Conveniently, this tuning lever tip wrench is capable of fitting most star sizes. It can fit size one all the way up to size four. This helps to make it useful for many different purposes and is another good reason to consider purchasing it. Aside from its overall utility, another standout feature is that it is exceptionally durable. This tool is made out of a hardened steel that is going to stand the test of time. You won’t need to buy another one of these unless you happen to lose it. It is very durable and will be a reliable partner for you when tuning pianos for many years to come. You’ll want to always keep this in your toolkit to make tuning lever tips much easier to deal with. There are going to be times when you are tuning a piano that you will require a piano regulating screwdriver. You need to have access to this tool in order to be able to turn regulating screws. These tools are specifically designed to make turning this screws as streamlined as possible. The screwdriver has a thin but durable design that will allow you to access the piano very easily. This is pretty lightweight but you don’t need to worry about it not being able to stand up to regular use. It is made out of a very hardy metal material, allowing you to torque on it without feeling worried. This is going to be a regular part of your piano tuning process, so it is an essential purchase. Being without one would present certain problems, so you will want to go ahead and track one down. This screwdriver here is twelve-inches long and has an opening that is perfect for turning the larger regulating screws. You will have an easy time getting a good grip on this screwdriver, and this will make everything seem as simple as it can. Tuning your piano will be a lot more pleasant when you have this screwdriver in your kit. The piano t tuning lever is an interesting tool that is going to be useful to you. When you are tuning your piano, you are going to need to take certain tuning pegs in and out of the instrument. Having access to this piano t tuning lever is going to make the process easier than it would otherwise be. You will be able to balance the tension more effectively and can make this process go a little quicker. If you want to understand what this tool brings to the table, then you need to look at how it is made. The tool is approximately six inches long and features a square tip. The handle of the tool is five and a half inches long, meaning that the handle is almost the same length as the tool bit. It is optimal for making stringing work simpler than it would otherwise be. The way that you hold this tool is what makes it easier to use in certain situations. Some people would never want to have to tune their piano without having access to one of these. 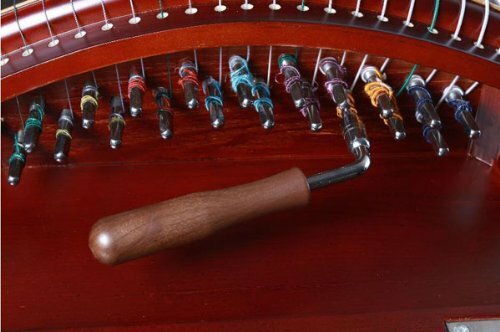 The tool can also be used to help with other string instruments, so if you are a multi-instrumentalist, this will be a handy tuning tool to have in your collection. The t grip on this tool feels very nice to use and it will help you to make the process of tuning your piano more pleasant overall. It is possible to tune a piano without one of these t tuning levers, but it is smart to buy tools that can make your life a bit easier. The purpose of tuning your piano is to get it to sound the best that it possibly can. If you can have an easier time making this happen with the t tuning lever, then it is going to be a worthwhile purchase. It should also be noted that this t tuning lever isn’t all that costly, so purchasing one isn’t going to break the bank. The electronic chromatic tuner is what most people use to tune a piano these days. People used to use tuning forks for this purpose, but electronic tuners have become more commonplace. They are easier to use for novices and allow people to get accurate tuning in the most efficient way possible. If you want to be able to tune your piano swiftly, then it makes sense to buy one of these electronic chromatic tuners. Overall, these tuners are very cost-effective. It will cost more money than an average tuning fork would, but it is still not a significant investment to buy one of these. 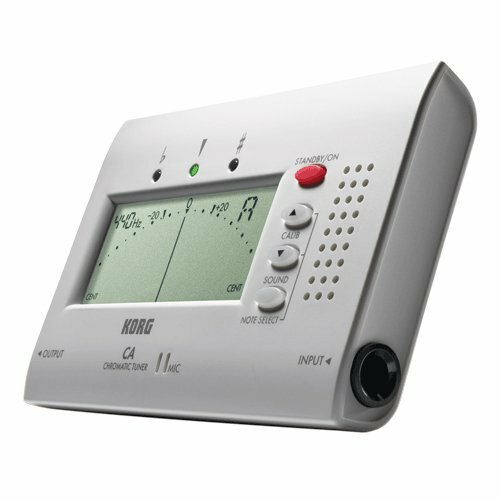 You can buy an electronic tuner and make use of it to tune your piano right away. This will help you to make the process go quickly, and you can be sure that it is being done properly. Even professionals make use of these electronic tuners in the modern era. Although many professionals do know how to tune a piano using just a tuning fork, they make use of the electronic tuners in order to expedite the process. If you are new to the idea of tuning a piano, then you will want to go the electronic route. It is going to be far simpler for you to use, and it will work nicely. This model right here has a great LCD screen that is easy to read. The needle will allow you to determine all of the information that you need to know. With a wide detection range and powerful calibration capabilities, this is a great tool to have available to you. Buy one if you want to be able to tune your piano fast while remaining as accurate as possible. Tuning forks are still widely used to help tune pianos. In the past, this used to be the most important tool aside from the piano tuning hammer. In modern times, many people have taken to using the electronic chromatic tuners, as mentioned above. Even so, a good tuning fork is going to be quite useful in the right hands, and there is some merit to purchasing one. It should be noted that a tuning fork isn’t just used to help tune pianos. This tuning fork is going to be very useful when you want to tune any stringed instrument. It can be used to help tune any type of instrument that can be tuned, but it is most commonly used with stringed instruments. Just about any type of musician will find a tuning fork to be very useful. This tuning fork right here is made out of a high-quality steel. It looks really nice and is capable of delivering a clear tone. This is essential when you are looking to tune something with great accuracy. The clarity of the tone will allow you to perform the task properly. When you aren’t using this tuning fork, you can place it inside of the included soft shell case. It also comes with a cleaning cloth so that you can wipe it down after you have used it. This is good for when you get fingerprints on your tuning fork and want to keep it from looking shabby. Buying a tuning fork is a great idea, and you may want to own one even if you already own an electronic chromatic tuner. 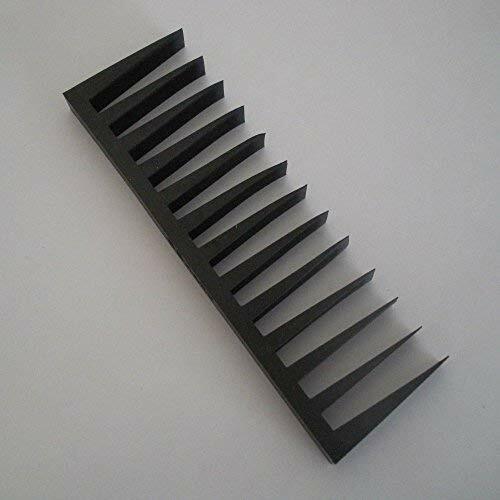 Rubber wedge mutes are very commonly used to help tune pianos. These mutes are really a necessity if you want to be able to tune your piano accurately. You’re going to need to mute certain notes, and inserting the wedge mute in the right spots will allow you to do just that. This allows you to isolate certain areas that you need to tune so that you can get clear readings. Most wedge mutes are made out of rubber because it has really good sound dampening properties. You will find wedge mutes that are made out of other materials, but they are a bit less common. One of the problems that people have with these wedge mutes is that they aren’t the quickest tools to use. You have to take the time to meticulously place them where they need to go, and this can somewhat slow down the process of tuning a piano. You may have better luck using a wedge mute on specific parts of your piano and then making use of other mutes for certain spots. This may help to save you a bit of time and is something that you should consider. Whatever your decision winds up being, you will want to own several of these rubber wedge mutes if you’re going to be tuning pianos very often. The set of wedge mutes being shown here comes with two different mutes. You can also purchase rubber wedge mutes in different sizes, allowing you to buy the proper wedge mute that will work best in a certain spot. Do your best to buy all of the wedge mutes that you need. You want to make your piano tuning task as easy on yourself as you can, and you will need all of the best tools to make it happen. Gang mutes are definitely something that you will want to have access to when tuning your piano. Some people don’t see the gang mute as an absolute necessity, but others would never dream of attempting to tune a piano without one. Simply put, a gang mute is going to allow you to mute multiple notes at once. It is very easy to use and will help you to tune your piano very accurately. Generally speaking, gang mutes are made out of rubber materials. Natural rubber is an excellent material when it comes to muting sounds. It has all of the properties that you need in order to mute sounds effectively, making it the perfect choice when creating a tool like this. This gang mute here is constructed all in one piece and features thirteen wedges. The mute is six and a half inches long, and this will make it easy to mute multiple notes at the same time. The biggest reason that people use these gang mutes is that they can potentially speed up the process of tuning your piano. Saving a bit of time is nice, and it is easy to make use of these gang mutes. They’re very cost-effective, so it will be a good idea to purchase at least one. Sometimes gang mutes will be included in piano tuning kits that you will see on the market. This can be a useful way to get multiple tools that you need all in one convenient location. The gang mute being shown here is a standalone product, so just think about what your needs are before purchasing. You’ll be able to get all of the tools that you need and can then tune your piano much more effectively. A treble mute can be used very effectively while you are tuning a piano. It isn’t an absolute necessity for tuning a piano but it will come in handy when you want to get the best results possible. Using this treble mute is going to allow you to mute particular treble strings by placing it in the right spots. You need to place it on the middle string of a three-string treble in order for it to work properly. The reason that people like using these treble mutes are that they can be placed so quickly. You can easily grab the treble mute and place it where it needs to go. In some ways, it is easier to use than the wedge mutes that are more commonly used. Using treble mutes in conjunction with other mute types is probably going to give you the best results. You will find a few different variations of the treble mute that are on the market. The one being shown here is probably the most common. You can also find treble mutes that are simply like sticks if you would prefer to purchase that. Regardless, this treble mute is going to work great for muting strings quickly. This mute is made out of a nylon material. It comes with a convenient storage case so that you can keep it safe when it isn’t in use. You can purchase this tool at an affordable price, so it is definitely worth adding to your collection. This will help you to tune your piano more swiftly, and you’ll have a better experience overall. If you want to keep your head safe while you’re working inside of your baby grand piano, then it is going to be beneficial to purchase a piano lid prop block. Pianos that feature lids can be a bit trickier to work on in some ways when compared to console pianos. Luckily, purchasing a lid prop block will eliminate some of the problems with having to worry about keeping the lid in place while you’re performing the tuning work. These lid prop blocks are actually very affordable. It won’t cost you too much money at all to buy one of these and they will be useful if you have a piano that makes it necessary. You could probably get away without buying one in most instances, but this can just make things more convenient. Since they are rather inexpensive, it makes sense to just go ahead and buy one to save yourself the hassle. You want to be able to focus on tuning your piano completely while you’re performing the task. Not having to worry about the lid falling down or whether or not anything is going to shift is important. Purchasing one of these is a simple way to make the experience a little easier. You’ll want to use this every time that you are tuning a piano with a lid. This particular piano lid prop block is made out of brass. This is formed brass and the outside of this prop is covered with felt in order to protect the piano. This lid prop block is only five inches long, but it makes a huge difference. This tool will also help to keep your walls from getting dinged by the lid, so you should definitely consider purchasing it. These piano tuning wool felt temperament strips are going to come in handy. People who tune pianos for other professionals find these strips to be a crucial part of the tuning process. It’s actually really simple to make use of these strips, too, so you will be able to mute many strings at once if you have some of these strips available. Being able to mute multiple strings is always good, and you’ll have a convenient time using these once you know what you’re doing. Simply place these strips on the outside strings of your trebles. You want to make it so that only one string is going to sound a note. This allows you to isolate it and tune it properly. When you want to be very accurate with your tuning, it pays to have some wool felt temperament strips in your toolkit. The way that you use these is interesting, too. You apply the strips where you need them to go and then simply push the felt in where you need it to be. This allows you to isolate notes without having to continually re-position the temperament strips. 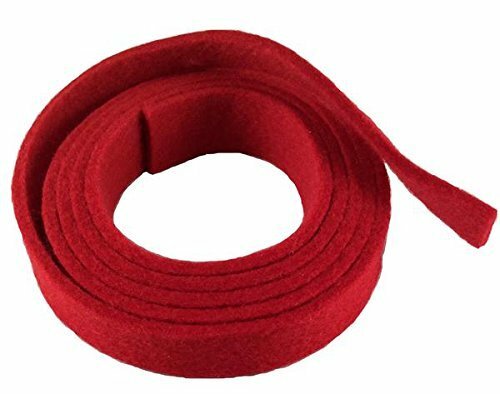 It’s going to be a huge boon to your efforts if you have some of these strips. These strips are so popular that they are regularly appearing in piano tuning kits at major retailers. The temperament strips that are being shown here are a standalone variety, but you should keep in mind that you can get them in kits. If that would be more useful to you than buying the strips alone, then you will want to consider it.